Adare Manor re-opened last November after a 21-month overhaul and extension that included 42 new rooms bringing the count up to 104 with the addition of our Manor Lodges and Garden Cottages, Ireland’s only La Mer Spa, a 350 person Grand riverside ballroom and a Tom Fazio-designed golf course. Changes included The newly designed David Collins Clubhouse, now known as the Carriage House, is a new dining optionand a more casual option to the gastronomic Oak Room restaurant in the Manor, a purpose built boardroom and cinema. B&B ranges from €500 per night for a Classic King to €2,250 for a Signature Suite in shoulder season. The written Virtuoso citation said “Maintaining the estate’s neo-Gothic architectural heritage and stonework was but a small portion of the fantastic overhaul,“. The ceremony honoured the year’s top 10 hotels and hoteliers before an audience of 1,700 of luxury travel figures at the 12th annual Hotels & Resorts Dinner. The Shelbourne’s Horseshoe Bar had also been shortlisted in the best hotel bar category, which was won by The Donovan Bar at Brown’s Hotel in London. The full list of winners can be found here. 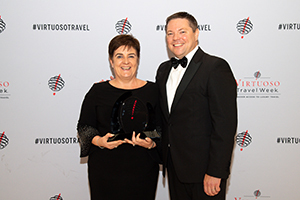 Siobhan Byrne Learat of Adams and Butler retained her status among 55 Virtuoso A-List travel professsionals worldwide.